Diamonds are the most beautiful, unique, and coveted jewels on Earth, but they’re also incredibly mysterious. The gems we see behind glass cases of jewelry stores and museums are often millions of years old and will outlast each and every awe-struck spectator enchanted by their radiance. The diamond is often thought of as a proclamation of love and commitment, used once (hopefully) to bookmark the end of one phase in a relationship and the beginning of a new, united, eternal one. When most people purchase a diamond, it’s an investment in their future, and the person they choose the spend that future with, but as someone who has spent their entire life surrounded by diamonds and working in the diamond business, what’s interesting to me is their significance over history and the journey they’ve taken as an indispensable part of our culture. The serpent is a guardian totem and an ancient symbol of healing. It represents transformation, wisdom and intuition. The word “diamond” is originally derived from the Greek word “adamas”, which meant unconquerable and indestructible. Before diamonds became an ancient form of currency or a modern symbol of love, they were surrounded by superstition, spirituality, magic, mystique, and divine belief. Plato believed that diamonds were living beings that embodied celestial spirits. In Hindu mythology, it’s believed that someone wearing a diamond is protected from fire, poison, thieves, water snakes, and evil spirits. Romans believed wearing diamonds into battle would make a warrior stronger and invincible, while others believe someone wounded or sick can be cured by the magical energy within each stone. According to some, the original discovery of diamonds was made between 2500 and 1700 BC by the Dravidians in India during the Indus Valley Civilization in the Bronze Age. Others believe the first diamonds were discovered in India closer to 1000 BC. Between 400 and 300 BC, the first recorded and written knowledge of diamonds begin to appear in the Sanskrit texts Arthashastra andRatnapariksha. Arthashastra is the earliest chronicle of diamonds being traded and used as a currency or source of revenue. In Ratnapariksa, we see the first recorded method of grading and ranking the quality or characteristics of a diamond. In both texts, there are references to the magical, powerful nature of diamonds, stating that those who wear diamonds will see “dangers recede from him”, regardless of the threat. These texts describe the diamond as “the jewel above all others” and the most desired, sought after possession in Indian culture. There is also early reference to diamonds being used as a tool for the first time in The Bible. In 327 BC, when Alexander the Great, King of Macedon, invaded India, he returned to Europe with diamonds from the region, exporting the stones for the first time. Around 120 BC, Eudoxus Cysicii, a Greek sailor, observed deep digging next to river alluvions. This is the earliest reference to diamond mining in European history. For hundreds of years, diamonds were used as a form of currency and symbol of power and status. It wasn’t until 1074, when the queen of Hungary has her crown decorated with diamonds, that the stones were used as a form of jewelry. Over the next thousand years, diamonds began to make their mark on our history. Royal families and powerful leaders exchanged them to seal an alliance and express their loyalty. The diamond industry boomed, with mines popping up in new countries and continents around the world, and eventually, they became a symbol of love and commitment. In the early 13th century, Koh-i-Noor (Mountian of Light) the first “famous” diamond was discovered in the Golconda mines of India. Weighing over 790 carats at the time, it was believed to have magical powers and it became a legend that whoever owned the diamond ruled the world. Between the time of its initial discovery and today, it changed hands countless times, often during bloody, violent battles, leading some to believe that it’s actually cursed and brings bad luck to its owner. It is currently part of the Crown Jewels of the United Kingdom, set in theQueen Mother’s Crown and held inside the Tower of London. In 1477, Archduke Maximillian of Austria, head over heels in love with Mary of Burgundy, commissioned the very first diamond engagement ring, sparking a trend at the time to use diamonds as part of the proposal process and creating a tradition that we still follow today. As the demand for diamonds increased and their function began to evolve, the supply for diamonds needed to grow as well. In the early 1500’s, Vasco da Gama opened the direct sea-route to India and helped increase the quantity of diamonds being exported from India to Europe. As diamonds became more popular, it became necessary for them to take different shapes and sizes to stand out. In 1520, the “Rose Cut” was created to resemble a rose, and in 1562, Mary Queen of Scots sent a heart-shaped diamond ring to Queen Elizabeth as a symbol of their friendship. In 1638, Jean-Baptiste Tavernier, a French traveler and gem merchant, discovered the Hope Diamond in the Golconda mines of India during one of his six voyages to the region. He would go on to sell the 116-carat “Tavernier Blue” diamond to Louis XIV of France for the equivalent of 172,000 ounces of pure gold and a letter of ennoblement. It’s been on exhibition at theNational Museum of Natural History in Washington D.C. since 1958. While the Hope Diamond, pictured above, is most synonymous with Tavernier’s name, he has been linked to a number of great diamonds over the course of history, either as the person responsible for discovering them directly, or encountering and illustrating them over the course of his travels. One of these diamonds is The Orlov, which is mounted in Catherine the Great’s Imperial Sceptre in the late 1700’s. While Catherine the Great was ruling with her Imperial Sceptre in Russia, Marie Antoinette, Queen of France, was entangled in a dramatic diamond scandal that began her fall from grace. “The Affair of the Diamond Necklace”, as it’s known today, was an incident that took place in the early 1780s, four years before the French Revolution, and implicated an innocent Marie Antoinette in a fraudulent crime surrounding an expensive diamond necklace. Long story short, people who claimed to be buying the necklace on behalf of the Queen, with her permission, negotiated the price and terms of sale and stole it under the guise that it would be paid for by Antoinette in the future, only the flee the country and sell it. They were eventually caught and put on trial, and despite the Queens innocence and ignorance of the whole crime, the public believed she was instrumental in the planning and never looked at her the same way, leading to a downfall in her popularity and a loss of trust between the French people and their leaders. While all of this (and more) was happening in Europe, the rest of the world was on a mission to discover their own diamond mines and reap the benefits of their value. In 1725, Brazil discovered their first diamond mines. By 1870, they had mined over seventeen million carats worth of diamonds. In 1829, alluvial deposits were found in the Ural mountains of Russia, which led to the regions first diamond mines. In 1851, the first recorded diamonds and mines were found in the Bathurst area of New South Wales, Australia. The diamond boom began in South Africa around 1866, continued with the discovery of even more mines near the Orange River in 1870, and really took off in 1871, when the “de Beers” and “Kimberley” mines were discovered. This led to a larger global supply of diamonds stemming from South Africa, and by 1888, De Beers Consolidated Mines LTD was incorporated in South Africa and began to control the global diamond trade. Just a few years later, my grandfather was born in India, not far from the legendary Golconda mines, and began working with my uncle in the diamond industry, riding his bike from village to village selling diamonds by the bagful. In January 1905, Thomas Evan Powell, a miner working the Premier Mine in Pretoria, South Africa, discovered the Cullinan Diamond. Named after the owner of the mine, at the time of its discovery it was two times larger than any other diamond known to man and weighed in at 3,106 carats. It was eventually cut into a number of large and small diamonds, including the Cullinan I and II, both of which are part of the Crown Jewels of the United Kingdom. 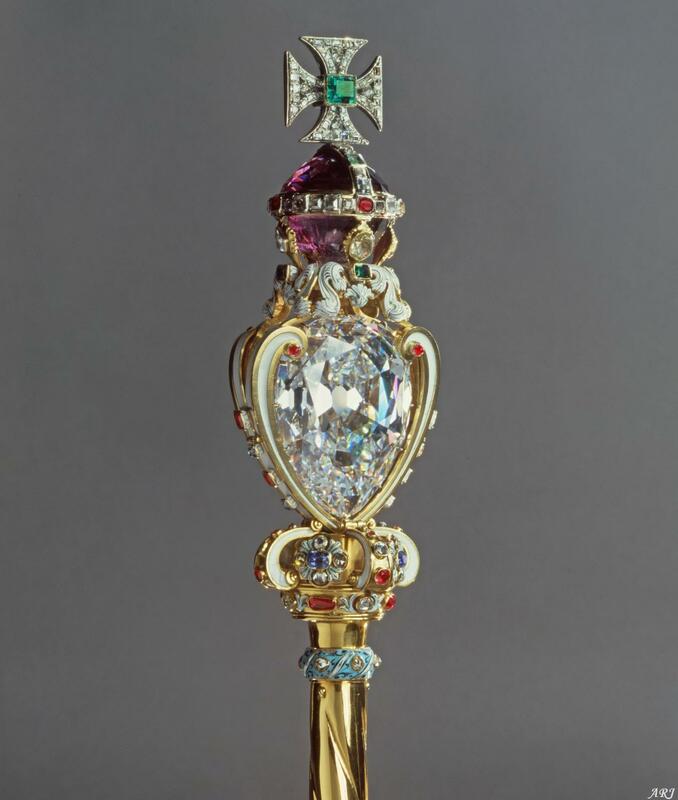 The Cullinan I is also known as the Great Star of Africa and is the largest cut diamond in the world, currently nestled at the top of the Sovereign’s Sceptre with Cross, pictured below. As the diamond industry began to boom in the late 1800s and early 1900s, and new suppliers emerged around the globe, systemic measures began to fall into place to help buyers and sellers alike have a uniform method of measuring the quality and value of their diamonds. In 1931, The Gemological Institute of America is created, inventing the 4 C’s (color, clarity, cut, and carat weight) to help measure the quality of each gem, as well as the international diamond grading system. Three years later, in 1934, The American Gem Society is created to help protect and educate consumers. While these organizations were created as a byproduct of so many new sources of diamonds, Golconda, the original diamond depot from India, still reigned supreme. 1933 marked the first record of the Archduke Joseph diamond, a 78.54 carat stone that came from the Golconda mines. It was named after Archduke Joseph August of Austria, and joins Golconda’s Hope and Koh-i-Noor diamonds as some of the most famous and valuable in our history. While its origin story is unknown, it’s value is undeniable. In 2012, it was sold at Christie’s Auction House for twenty one million dollars, a world record for a Golconda diamond. As organizations like the GIA and AGS began to determine the criteria for which a diamond should be measured, Harry Oppenheimer, the son of the founder of De Beers, saw a huge opportunity to sell more diamonds to the public. In 1938, he approached N.W. Ayer, an advertising agency in New York, to create an ad campaign that would create the perception among the public that diamonds are a work of art. They began working together, and in 1948, N.W. Ayer created the “A Diamond Is Forever” slogan and ad campaign. Diamonds are now mainstream, with supply and demand at such high levels that anyone in the world can own one. With so many new sources of diamonds, and conflict stemming as a result of their value, the Kimberley Process was created in Kimberley, South Africa, as a way to stop the trade in “conflict diamonds” and ensure that the diamond market was not financing violence. In December 2000, the United Nations General Assembly took the first steps toward the creation of the Kimberley Process Certification Scheme (KPCS), an international certification for rough diamonds. As a continuation of this trend towards more ethical business practices in the diamond industry, theResponsible Jewellery Council (RJC) was created in 2005 to establish ethical standards, certifications, and best practices around the diamond business. While all of this was taking place on Earth, a new discovery was made in space that dwarfed the Hope, Archduke Joseph, and Koh-i-Noor Diamonds. In 2004, Lucy, the largest diamond known to man, was discovered in space by the Harvard-Smithsonian Centre…who couldn’t resist naming it after the Beatles song. It’s located in the constellation Centaurus at the core of BPM 37093, a dead star that became a white dwarf. It weighs 10 billion trillion trillion carats and is larger in diameter than our moon. It also produces sound frequencies and music similar to the sound of a gigantic, galactic gong. After discovering Lucy, scientists believe that one day in the very distant future, our sun will become a diamond too. Until that day comes, the diamonds on Earth will have to do, and in 2009, a new one was discovered in South Africa that made headlines in the news. Cullinan Heritage, a 507.55 carat Type IIa* rough diamond, was discovered in South Africa and purchased by Chow Tai Fook, Hong Kong’s largest jeweler, for $35.3 million. The term Type IIa describes a specific and rare chemical composition reserved for the brightest, purest, highest grade diamonds. Only about 2% of the world’s diamonds are Type IIa, including all of the diamonds found in Golconda mines, and a defining characteristic of these diamonds is their complete lack of nitrogen. Over the course of 47,000 hours, the Cullinan Heritage diamond was cut into over 11,000 smaller stones, all of which were used in the creation of the necklace below. In 2015, Blue Moon, a 12.3 carat diamond, became the world’s most expensive after selling for $48.4 million at a Sotheby’s auction. Which brings us to 2016, and more specifically, today. On June 29, 2016, the largest rough diamond in over 100 years goes up for auction at Sotheby’s London. Discovered in Botswana and called Lesedi La Rona, or “our light”, it weighs in at 1,109 carats and is the being hailed by David Bennett, a chairman at Sotheby’s jewellery division, as “the find of a lifetime” and one of the largest diamonds to ever be offered at a public auction. As new diamonds continue to be mined and old ones continue to be discovered, I’m excited to see where the diamond industry goes next. The world is constantly changing, but one constant throughout all of the turmoil and transformation is the significance and value of diamonds. They transcend economic highs and lows, currency fluctuations, deprecation, and generational culture shifts. Their strength, beauty, and durability are unparalleled by any other natural substance on Earth. When you wear a diamond, you’re not just wearing a piece of art or a symbol of love. You’re wearing a piece of history.